Last week in our Android customization series, we used Tasker to create a silent mode and use it as a sleep mode for your device. The premise was fairly simple, figure out what time you want your phone to be silenced at night, and silence it. But what if an emergency call comes in? Let’s use Tasker to make sure you don’t miss those calls. Disclaimer: The following Tasker Tasks and Profiles work toward never missing specific incoming calls, but should not be considered a definitive solution to missing calls due to a silenced ringer. There are several methods you can take to solve the problem of missed phone calls due to a silenced ringer. Today we are going to keep it simple, we will identify the person calling and increase the ringer volume so that the call is not missed. The theory behind this solution is also simple, and dependant on a significant factor, that your contacts don’t usually call you at night. For most of us, our parents, for example, do not call us in the middle of the night, unless there is a problem. These are the types of ’emergencies’ we are looking to address with the following procedures. You will need Tasker installed on your Android device. Tasker is currently $2.99 in the Google Play Store. Let’s set two things here, first, the logical move, we’ll crank the ringer volume. You may find that having the ringer turned up is enough for your needs. If not, or if you just want to add some flair, there are a few notifications we can try. I suspect you’ll want to maybe flash your notification LED or maybe turn on your Torch (camera flash,) you could also try a custom vibration, if your device supports these things. Just for the fun of it, I am going to play an audio tone of a morse code message – how fun is that! Head into Tasker, navigate to the Tasks tab and tap the “+” symbol at the bottom to create a new Task. Name the Task uniquely and concisely. I will call mine “EmergencyCall”. Tap the “+” symbol to add an action. Adjust the volume to an appropriate level, or just go ahead and crank it, nothing wakes you up like a super loud phone ringing. I’ll just set mine to 5. Tap the system back button to return to the Task Edit screen. Tap the “+” symbol to add another action. Enter the text to convert. I’ll just go ahead with “SOS Emergency SOS.” Note: It’s all fun and games now, but if this thing ever actually goes off, please make sure you have set appropriate notifications that will wake you and ensure you answer the incoming emergency call. Tap the system back button to return to the Task Edit screen, then again to return to the Tasks tab. We now have the Tasks ready to run to wake you for an emergency call, what we need to do now is determine what an emergency call is and use it to trigger the Tasks. You will have to determine for yourself what constitutes an emergency caller. I’ll keep mine simple, if my contact ‘Parents’ call me in between 23:00 and 6:00, I know something is wrong. Navigate to the Profiles tab. Tap the “+” button at the bottom to create a new Profile. Tap the magnifying glass search icon to the right of Caller. Select your contact, I will choose Parents. Obviously the contact(s) you choose will differ for each of you, and you will likely want to tap the magnifying glass again to choose another contact or two. Add as many contacts as you would like, just be certain that they all share the same approximate sleep schedule. Contacts are separated by a “/”. Manually add “?” as a contact name if you wish to account for hidden and unknown callers. Since we are doing this for emergencies, let’s go ahead and change the Priority to High. This is not necessary, but it helps. Tap the system back button. You are presented with a list of all of your created Tasks, choose your emergency call catcher Task, mine was called EmergencyCall. We could call it quits here, you would never miss a call from the specified callers, but what if you are trying to use this setup for a meeting or a movie? Of course, you would need a different technique for notification of the call, I’ll leave that for you to handle, just follow this guide, changing up your notification styles, and continue from here with an additional condition on the profile. As mentioned earlier, I only want to consider a call from Parents to be an emergency if they call in the middle of the night. So I’ll need to specify my time frame as an additional condition on the profile. Set a From: time. Might I suggest using the same 10pm, or 22:00 on the 24 hour clock, that we used to silence our device last week. Set the To: time. Might I again suggest 7am, or 07:00 on that 24 hour clock. Tap the system back button to complete. There you have it – if I receive a call from my parents between ten at night and seven in the morning, my phone will bypass my sleep/silent mode so I don’t miss the call. Depending on your settings, you’ll be wide awake after an emergency call comes in, but you may consider creating an Exit Task to turn your Ringer Volume back off. Perhaps you already have the NoCalls Task from last week, try triggering that. I urge you to think about other Profiles and Tasks you could create using the basic procedures described in this tutorial. Perhaps you would like a WorkCalls Profile that provides a single beep, or no sound at all, along with a custom vibration pattern. Perhaps you might want to have Tasker send an SMS to the caller, letting them know you are busy. Perhaps you would use Tasker to send yourself an email with the particulars of the call. I am just scratching the surface here folks, bottom line, you now know how to identify specific incoming calls, what do you want to have happen? Let’s shift gears for next week, I’ll start off by showing you how to use Tasker to automate your screen timeout. You know those times when your screen goes to sleep too soon, or stays up way too long, let’s take control of that. Then, if we have time, we might also figure out how to customize the screen rotation settings too. 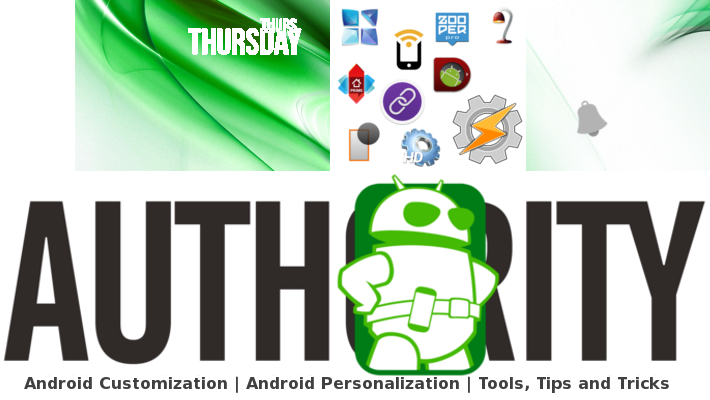 remember to check back every Thursday for new tools, tips and tricks in our Android customization series. With all of the ways you could have handled todays task, what route did you choose? Can you think of any ways to streamline and bulletproof the process?